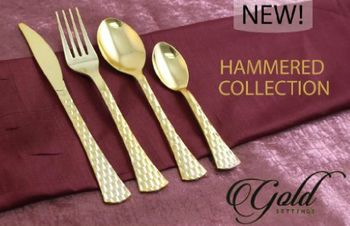 When it comes to plastic cutlery, the Hammered Gold has one of the most unique designs of any we have. It adds a touch of class and sophistication to any holiday or Thanksgiving dinner and provide an elegant look for your wedding reception. The hardest part of planning any even is the cleanup when it's all done. Why not get the look of China without the mess? Hammered Gold Plastic Cutlery looks like the real thing, but gets tossed into the garbage when done. China-like tableware is more popular than ever, so let us provide it for your special day.